We sit down with Adrian Cuenca, executive chef of Elbert’s Steak House. We’re also quite privileged to work with him as our featured chef for the Best of the Beast dinner this month. What is your earliest food memory? Who, or what, provides you with most inspiration? My family was always into food. From the time I was three or four years old, my father would bring me to the home of some relatives who were from Batangas where we would have some unforgettable arroz caldo. I have many sources of inspiration: whether it be from a well-executed and memorable dish I experience when eating out, or from watching cooking shows, reading cookbooks & researching recipes on the web… I try to innovate and elevate with my own new ideas on flavor and texture combinations. For example, the idea of adding bone marrow to burgers came from Julia Child’s famous cookbook, ‘The art of French Cooking’. The idea of adding truffle sauce came about when I ate the roasted bone marrow at Pepato : it was served with truffle sauce on the side, and until then, I never knew that truffle and bone marrow was such an incredible combination. Tell us how you got into the culinary world? My sister was a great cook and worked in F&B. She had two shelves of cookbooks that I inherited from her by default when she took a job in telecoms and then moved to the US. When I was around 8 years old and I took an interest in those cookbooks. My father’s family ran a Japanese restaurant where my brother Elbert worked before he put up his own restaurant called Restaurant 12 in Greenbelt. My parents loved food and travelled a lot and would bring home lots of stuff from abroad from cheese to steaks. I had a natural interest in food which developed into interest in cooking. What was your first job in the food business and what was it like? My first venture in the food business was a small business selling chocolate chip cookies right after I graduated from a Liberal Arts degree at DLSU. 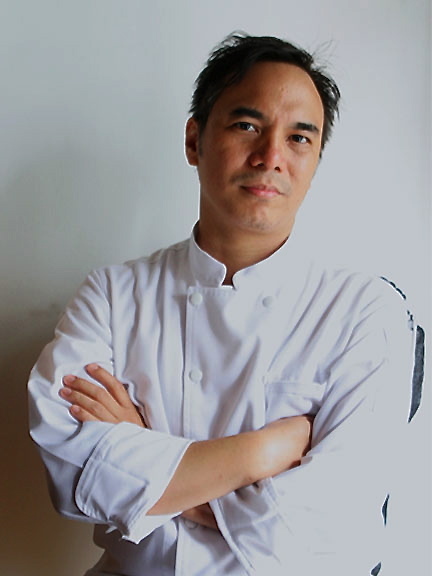 My first job in a restaurant was apprenticing under the late Chef Henry Canoy in a restaurant called Henry’s in Mandaluyong. He was way ahead of everyone’s time. I saw first hand how a creative mind works in cooking. Basically I would watch Chef Henry create a dish on the spot with the many ingredients available on hand. What’s your favorite item on your menu and when was the last time you had steak? My favorite item is the Super Prime Striploin. Most people don’t order it because it’s not soft and tender like the rib eye or tenderloin since you need to chew a bit more but the muscle tissues in the meat make it much more flavorful than most steak cuts. The last time I had steak was a couple of weeks ago when I had a slice of our roast prime rib (the last time I had it seemed ages ago). I never crave for steaks anymore, because I’m around them all day, but that day I didn’t have time to have breakfast and that prime rib just looked so enticing, and tasted just as good as it looked, too. We know you see and breathe steaks day in and day out, but what do you like eating or cooking in the off hours? Anything and everything, depending on my mood. Sometimes when I get home late, I love eating and cooking a real carbonara (no cream) – when there is guanciale available – and I pair it with a nice Cereveza Negra. It’s easy to prepare and is a staple comfort food of mine. Recently, I cooked a big pot of fabada with morcillas for my family; and I had it for 3 straight meals. Another time, some good friends gifted me with a jar of summer truffles, which I mixed with very slow-cooked scrambled organic eggs… and again, I had it for three straight breakfasts. Creating any menu is quite challenging. Did you encounter such challenges while creating Table for Three, Please’s Best of the Beast menu? Anything you wanted to highlight besides the obvious beef theme? I had been planning to organize a small private dinner with some friends since last year that never pushed through, so most of the items for the dinner on the 30th I’ve already come up with. The challenge is getting all these items perfect inside my tiny kitchen during the dinner. I’m pretty excited though. Its not often I cook for such a group of foodies and it’s not the usual items on our menu. My current food obsession is ramen. For a couple of days, I learned from the Japanese chefs of Yushoken. So I tried making my own ramen broth. I first started making ‘tantanmen’ but I couldn’t get the flavor right. At first I wanted to make my own version, which was subtle like Yushoken but had a slight kick of flavor like Ukkokei’s. I couldn’t get it right. Then I tried to make my own shoyu tonkotsu. I also could not get it right but I realized the problem was that my tonkostsu broth was not rich enough. The frustrating thing is: it takes 8 to 12 hours of cooking that damn tonkotsu. So now I will pause first from perfecting the tonkotsu broth and focus on making my perfect shoyu ramen, using a clear broth as my base with some inspiration from David Chang’s book, ‘Momofoku‘.I’ve already perfected my own chashu. I’m lucky to have access to excellent ramen noodles from Yushoken, hence the obsession. Maybe the next one night special dinner can be a ramen night. What’s your favorite food destination and why? Depending on the cuisine I’m craving for, there are more than I can mention. Because of my schedule, my food destinations are limited to those that are open all day until late. Yushoken, (of course) whenever I’m in the south, which is more often than not since my girlfriend, lives in that area. My best meal of the year so far was at Sensei Sushi and I’ve been looking forward to going back there.I also love Tonkatsuya because of its consistent perfectly cooked tonkatsu. For Mexican, I go to El Chupacabra. The first time I ate there around a month ago, I had four tacos! I also love comfort Chinese food, particularly the noodles and soup from Mien San or Suzhou Dimsum. Whenever I need a vegetarian fix (from too much meat in the restaurant), I go downstairs to New Bombay for some Dal or some vegetable kofta with Nan. What is your biggest culinary guilty pleasure ? (Burger Machine’s) Bart Burger with Cheese and Cebu style liempo from Chic-Boy. Well-done steak. Really, what’s the point? Does cardboard taste good? What’s your most memorable meal to date? I’ve had several memorable meals, its difficult to choose just one. One unforgettable meal that comes to mind is the one I had at Iggy’s, Singapore a couple of years ago. The clever use of ingredients, the creativity with the very fine ingredients with an element of surprise blew me away. Another one that comes to mind is my first taste of real truffles was in Lusso a few years ago and I was astounded. The truffles just made everything ecstatically and arousingly good. We are expanding this year. We are going to operate the steak restaurant at the new ‘City Club’. We are also going to open a sandwich place somewhere in Alabang, which will be a spin off from our Elbert’s Cheesesteak branch in Rockwell. We are hoping Lartizan will join us in the spot much like they did in the past with Mickey’s Delicatessen. There are also plans to open another branch somewhere in Quezon City, which will be more like a music bar and we will serve non-grade beef for a slightly lower market. There is already a spot being offered to us. This will keep me very busy until the end of the year. Only when these new branches are set up and doing well, will we think of opening a new concept, which hopefully will be my own. I’m thinking of fine Filipino food. *Click here for more info regarding Table for Three, Please’s Best of the Beast dinner. I love El Chupacabra, too! Not only for the tacos and SF all-lean sisig, but the casual yet festive vibe. (The cheap beer helps.) I beat you, Adrian -- my first time there, I had FIVE! The minimum I've had is two, especially if there's a new flavor I haven't tried; I was there a few weeks ago and ate four. :-D So far, my favorites are the camaron ala diablo, carne asada, chorizo, and fish. La Maison - That's French, Right?